Very soon Renault will be launching two models to join its Twingo lineup. One will be the Renault Twingo RS and the other will be the Renault Twingo Gordini RS. These two cars are the “more specific versions” of the already launched the all-new 2012 Renault Twingo. 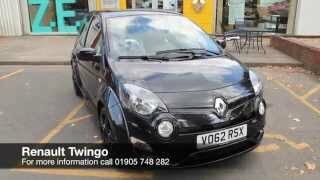 The Twingo RenaultSport or the 2012 Twingo RS is like the high-performance version of the regular Twingo. 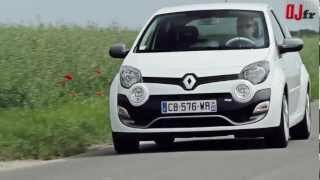 The Twingo RS carries a more powerful engine, a completely redesigned front fascia, and new rims compared to the regular Twingo. The front-end of the Twingo RS has F1 design elements which will not go unnoticed once you look at the car. The ‘F1 styling’ is more pronounced around the front grille, especially the front blade which has been integrated on the bumper. In terms of appearance, the RS will be available in yellow exterior finish, new front grille with integrated circular fog lights. The fog lights on the RS have been placed just below the headlights, right over the fascia. The 2012 Twingo RS will gallop on a new set of 16-inch alloy wheels. It features unique air vents, which has been integrated in the rear wheel arches. These air vents are there specifically for cooling the brakes. The new RS will also have a rear roof spoiler. Under the hood, the 2012 Twingo RS will be powered by 1.6 liter naturally aspirated diesel engine, which is already there in the RS Mk-1. The engine gives a max power of 133 HP @6750rpm and a peak torque of 160Nm @4400rpm. Fuel efficiency of the new RS will be 6.5 liters per 100kms and the car will add 150gms of CO2 per kilometer in the air. Changes have been made on the inside as well. The car will have yellow stitches on the steering wheel and seats. It will have an optional RenaultSport Monitor Onboard Telemetry System, automatic climate control and leather trim. In Italy, the 2012 RS will be available at 14,350 euros. 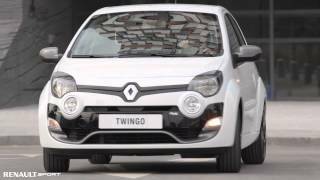 New Twingo R.S., which will go on sale from mid-March 2012, features the sporting interpretation of Renault’s new styling identity, including a dynamic grille design with four lights and a front bumper incorporating an F1-style blade. This detail, which now runs across the Renault Sport range, recalls Renault’s success in Formula 1. The hallmark Sirius Yellow finish will be available as an option from the end of May. The rear end of the car features a tailgate-mounted lip spoiler, a special bumper incorporating a diffuser and aerodynamic extensions on the rear wheel arches. Also available is a Design Pack which includes Grey/Dark Gunmetal Grey door mirror housings, F1 blade and R.S. lip spoiler, plus chrome details for the fog light surrounds. It will also be possible to specify new 16-inch ‘Emotion’ alloy wheels complete with ‘R.S.’-badged centre caps which proudly proclaim the car’s pedigree. Trademark Renault Sport yellow stitching will feature inside New Twingo R.S. (on the steering wheel, seats and dashboard cowl), while the dashboard, radio console, rev-counter housing and lateral air vents all come with Gloss Black inserts. The top of the steering wheel, seat backs and cushions, rev-counter surround and manual climate control controls are picked out in white. -unique for a small hot hatch: the optional R.S. Monitor, a functional and fun on-board telemetry system. Despite its exceptional performance credentials for its class, New Twingo R.S. boasts low CO2 emissions (150g/km, a saving of 3.2 percent compared to the former version) and fuel consumption (6.5 litres/100km, a saving of 3.0 percent). Since its launch in September 2008, Twingo R.S. has emerged as a top-three seller in its class (A segment / Very High Performance), with sales totalling more than 10,000 vehicles. Like its bigger sisters, Clio R.S. 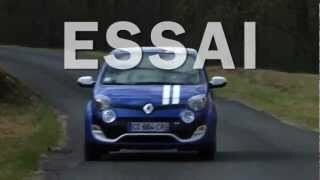 and Mégane R.S., New Twingo R.S. is supported by a network of 350 Renault Sport specialist dealers across the world, for expert servicing dedicated to performance cars. Thanks to its instantly recognisable style, 17-inch diamond-effect black wheels, leather trim and automatic climate control, New Twingo Gordini R.S. defines sporty chic in imitable fashion with its twin stripes. In addition to the blue interior option, a new grey interior can now be specified, irrespective of body colour (Malte Blue, Glacier White, Pearlescent Black or Vif Red). 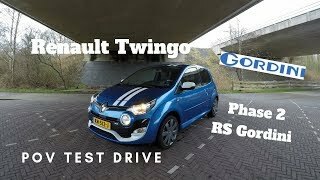 New Twingo Gordini R.S. adds a touch of refinement to the attraction of the Renault Sport range.